The G-20 summit highlighted a transition in geopolitical power that has been developing for years. The process has escalated in recent months since President Trump took office, but its roots go much deeper than Trump. Europe is tired of the US spying on its leaders and creating a massive refugee crisis from its chaos creating wars. Russia and China are being pulled together as the US threatens both with missiles and bases on their borders. Now Trump seeks more money from everyone to reduce the US trade deficit and holds the world back on the climate crisis. The United States is losing power, a multi-polar world is taking shape and people power is on the rise as the world unites for people and planet before profits. We may be witnessing the beginning of the end of US Empire. At the same time that Europe is setting its own course, Russia and China have been moving toward each other and acting in tandem, often with positions opposite the United States. While Washington was trying to isolate Russia, it has been building new friendships and alliances. Presidents Putin and Xi have met on more than 20 occasions over the past four years. Xi now refers to Russia as China’s foremost ally. In that time, the United States built a wall of bases and missiles around both countries, intruded on China’s maritime space in the Asia Pacific and fomented regime change in Ukraine to turn that country against Russia. US aggression is backfiring and creating a multi-polar world. After meeting with Russia, President Xi met with Chancellor Merkel to sign trade deals. Presidents Putin and Xi met before the G-20 to continue to build their alliance. Putin and Xi made deals on trade agreements and energy sales, created a $10 billion joint investment fund and came to a common approach regarding North Korea. Their approach: “dialogue and negotiation”, coupled with firm opposition to the THAAD missile system being installed by the US in South Korea. Even Japan’s Prime Minister Shinzo Abe, who has been a lap dog for the United States, called on China and Russia to help mediate the Korean crisis. 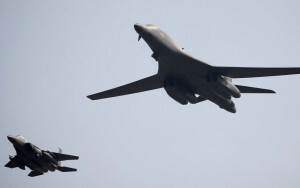 Instead of diplomacy, President Trump sent B-1 Lancer bombers capable of delivering nuclear weapons toward the North Korean border where they released 2,000 pound inert bombs. Others in Congress are suggesting more economic sanctions, including sanctions that will negatively impact China and other countries. These actions are driving North Korea to develop ICBM nuclear missiles in order to protect itself from the United States, and driving other nations away from the US. North Korea responded by calling the US’ action a dangerous provocation that could lead to nuclear war. “More of the same” will not only continue to raise tensions but misses a tremendous opportunity to transform the relationship with North Korea and end the Korean War. 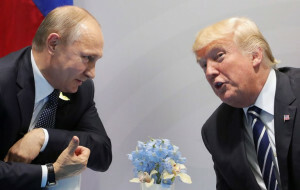 Russia sought to reduce tensions by providing the United Nations with information demonstrating North Korea did not produce an ICBM, but only a mid-range missile. The world knows that North Korea is not the real threat to world peace, the United States is the problem, as William Boardman explains. President Moon, the new president of South Korea, wants a ‘sunshine policy’ of constructive engagement with North Korea, including building economic ties. Already divisions are showing between the US and South Korea, especially over the THAAD missile system. The system was rushed into Korea during the recent elections, despite Moon’s warnings. Moon has said that South Korea must take a lead role in reducing tensions. He ordered an investigation of bringing THAAD equipment into the country. Throughout the Obama term, trade negotiations were bogged down because the US was out of the mainstream, calling for greater transnational corporate power than other countries would accept. This was one reason why negotiations slowed and the TPP was killed under election year pressure that made the agreement toxic. Now Trump wants to be even more extreme in favoring US corporations. One potential piece of good news this week was President Trump meeting with President Putin for more than two hours. The meeting overcame the Russia-phobia put forth by a barrage of anti-Putin, anti-Russian propaganda that has been produced for many years. The US desperately needs a positive relationship with Russia, not just to avoid conflict with a nuclear and economic power, but because the US is becoming isolated. While not a lot came out of this first meeting, it did provide a good start for the potential resolution of many conflicts – Syria, Ukraine, North Korea, Iran and nuclear weapons (where they should work to achieve the goal of no more nuclear weapons voted for in the UN), to name a few. The meeting produced a small step that could grow into a significant positive change. The US and Russia announced a ceasefire in part of southwestern Syria that Secretary of State Rex Tillerson and Foreign Minister Sergey Lavrov have been discussing for weeks. This could allow the US to play a positive role in Syria, in a war it has been losing. The RussiaGate myth was the top priority of the media and bi-partisans, rather than the potential Syria breakthrough. While the propaganda on alleged Russia interference continues, the US political class ignores the positive potential of the cease fire in Syria, closes its eyes to the potential undermining of the agreement by the Pentagon and talks about the myth that Russia elected Trump. As each new RussiaGate myth is published, it is shown to be false. Finally, another lesson from the G-20, people around the world are angry at political leaders who are failing them, including Donald Trump for holding back urgent action on climate change, fed up with globalization that puts people’s needs far behind the profits of transnational corporations, and are demanding changes to a system that does not listen. Protests began before the summit and grew in size and anger as the summit progressed – always met with extreme police violence. The protests in Hamburg were large and loud. The rioting got a good deal of attention, but people expressed their concerns on multiple issues in many ways. Srecko Horvat writes about the importance of protests to show opposition and power, but also the need to continue the work of building alternatives to the current failed systems. A growing political movement is expressing what is so desperately needed. People look at world leaders posing in group photo to show an image of success as false emperors and empresses wearing no clothes. Angel Merkel, the host of the event was careful not to exaggerate, summing up the meeting merely saying “The summit took place.” The realities are growing inequality, increasing impact from climate change and political systems that are less responsive to the people and more corrupted by transnational corporate power. 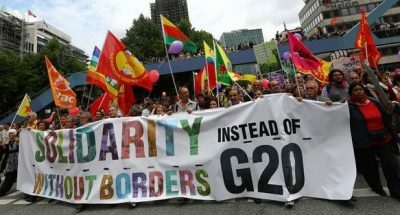 The root problem for the G-20 is they are unable to break from free market neoliberalism that is bringing devastation to the world. The people must force them to face the reality that transformation to economic democracy is needed — a new economy where people share the wealth and have influence in the direction of economic policy.